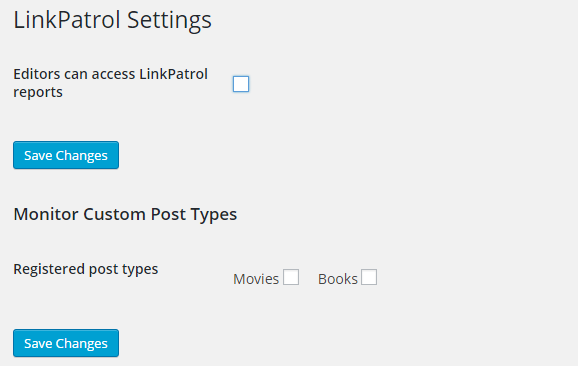 In LinkPatrol settings page (LinkPatrol > Settings) you can allow editors access to LinkPatrol reports. By default, this option is disabled and only Administrators are able to access LinkPatrol pages. By default only WordPress built in posts and pages are scanned. If you have registered public custom post types that you want to scan you can check them in the settings page. If you don’t have any registered public custom post type the second section “Monitor Custom Post Types” will not appear in the settings page.